A waterproof jacket is essential backpacker gear, yet it need not weigh you down. GoLite's Tumalo Storm Jacket is seriously light at 9 ounces (245 grams). It includes two waterproof, zippered pockets in the front, a fixed hood (which I prefer), and two zippers under the armpits which can be opened for ventilation. 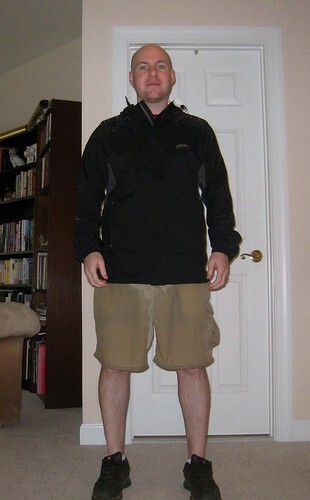 The GoLite Storm Jacket kept my upper body dry in a torrential downpour. But as nice as the jacket looks, the real test is in how dry it can keep you. So a few days ago, after hearing the crackle of thunder, I put on the jacket and stepped outside into a torrential downpour. Within 60 seconds, my shorts and shoes were soaked. The rain was coming down so hard, and the jacket is so thin, that I could feel the pressure of individual rain drops pelting my shoulders. After a few minutes in the rain, I walked back inside and snapped some photos. 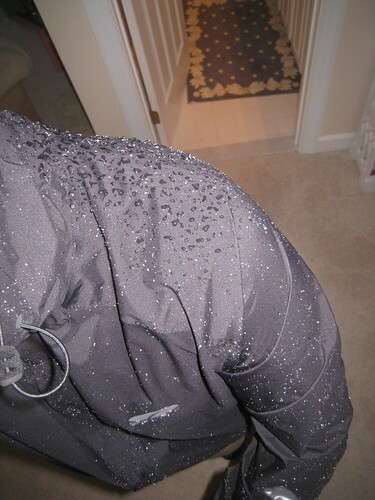 Below, you can clearly see how well the jacket repels water by the way it is beading on the surface. Underneath, my t-shirt was perfectly dry. Water beading on the jacket's surface. The exterior of the jacket is 100% nylon, while the interior lining is a technology called Pertex Shield DS. Pertex® Shield DS–Pertex® Shield DS combines a technically advanced face fabric with a proprietary bi-component polyurethane coating technology specifically engineered for unlined garments. This durable and extremely lightweight fabric has exceptional stretch and provides the optimum balance of waterproofness and breathability. The ” dry touch” hydrophilic PU coating reduces internal garment condensation and eliminates the sticky, clammy feel of other coatings. That's a bit too much tech-talk for me, however one thing I can say for sure is the jacket is as effective at repelling water as any of the past North Face jackets I've owned over the years. Detail of cord closures for the hood. There is one feature of the jacket which I'd like to see improved. 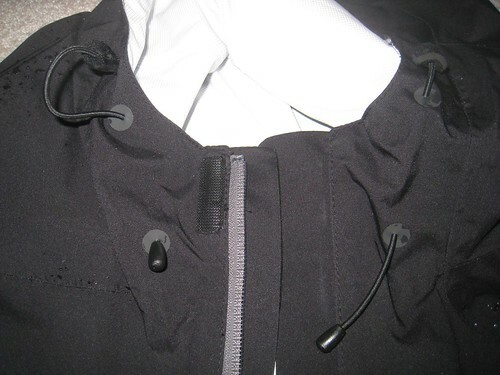 The cord closures for tightening the hood rely on a small piece of foam to keep the cord cinched. While I was standing in the heavy rain, I found myself fiddling around with them trying to get the hood tightened. I'd rather they sacrifice a few grams of weight and use a plastic widget, versus the foam which I found hard to get a handle on in the rain. 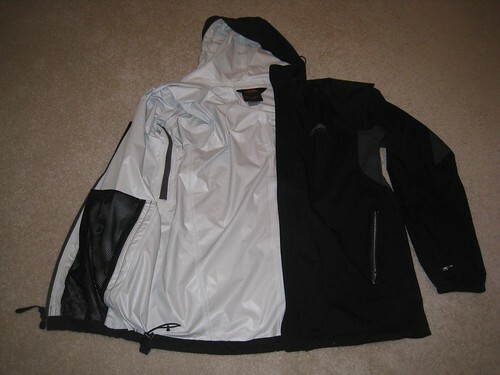 Otherwise, I liked everything about GoLite's Tumalo Storm Jacket – the fit, weight, and effectiveness. I'll be depending on it to keep me dry through Colombia's next rainy season. GoLite gear is available at a variety of outdoor retailers, online and off, including REI. Colors: Ocean Blue, Rust, Chili Pepper, and Black. GoLite Guarantee: They will replace any gear with a manufacturing defect for the lifetime of the product, for free. Disclaimer: I received a complimentary jacket to test and review on Go Backpacking. I got one of these as well. I LOVE it. It's been a lifesaver in some heavy storms and was surprised how well it kept me dry. Great review Dave. Mine was positive as well. Only complain was I found the zippers in the pockets can get some water in but there needs to be serious rain for it to go that deep. Oh and GoLite's products are simply fantastic so bonus points on that. Thanks for the review Dave. I have an old Columbia waterproof which is no longer waterproof and was never light. I really should invest in a new one when I leave New Zealand. Always comforting to buy a product with a lifetime warranty. Yeah, and the company philosophy and values are really contemporary – I like that. How would you compare this to a Patagonia rain shell. I have an older shell from them, waterproof and windproof and it will be needing replacement next season? In the last 10 years or so, I've only been using similar style North Face jackets, and I think it's comparable. I'll have a better sense after I've used it a little more, like when I head down to Colombia in a few weeks. Check out the GoLite website though — they have a very progressive set of values toward the environment. Unlimitedgb.com’s technical support is very good..i can clear my doubts whenever i needed. Hey there! I’ve been following your weblog for some time now and finally got the courage to go ahead and give you a shout out from Porter Texas! Just wanted to mention keep up the great job! Enjoy numerous distinct video games and genuinely evaluate all that you can. The very first step before leaping into anything is to search prior to you leap– so analysis flash online games just before you make a decision to make them. Engage in several different online games and actually review all that you can. The 1st step ahead of leaping into something is to look before you leap– so analysis flash online games prior to you determine to make them.